The Gym and Elite Gym have been updated. They both have brand new art and an improved layout. You should notice that it is now a lot quicker to enter, pay and complete gym sessions. The Diamonds have also been updated. The Bubble Pit in Jenoa has been updated and is now linked to from the Battle Arena. Visit and Pleon will chant her spell to heal your pet's health for the Battle Arena. A new Weekly Item Contest has just started. This week's item is Red Round Table, you will need to send this item to the 'Challenge' account. The challenge is to send as many of this item to 'Challenge' this week. The top 3 players at the end of the challenge will receive a Chinese Easter Egg, 200,000MP and a Gold Trophy, the next 6 players will receive 150,000MP and a Silver Trophy and the next 9 players will receive 100,000MP and a Bronze Trophy. The Lottery in Biala Mountain has been updated. The artwork and layout has been improved. You can now buy a maximum of 125 lottery tickets per week, costing 100MP each. The weekly jackpot has been increased and there is a new 'Lucky Dip' feature, which will automatically select random lottery numbers for you. You could also randomly win a Snow Costume whenever you buy a ticket! Stamp Albums in the Biala Mountain have been updated. If you have completed all 30 stamps on the 'Marapets' stamp album page, view this page and you will be rewarded with 25,000MP, 8 new items and a new medal for your profile. There are 3 new Gourmet Microwave Foods. The Bacon Book is a gourmet food and a book. The Pear Ukelele is a gourmet food and a musical instrument. Can you find the recipes? A new Weekly Battle Contest has just started. This week's opponent is Excavator, you will need to have a Excavator Trading Card in your Battle Deck. The challenge is to win as many battles against this opponent this week. The top 3 players at the end of the challenge will receive a Operative Trading Card, 200,000MP and a Gold Trophy, the next 6 players will receive 150,000MP and a Silver Trophy and the next 9 players will receive 100,000MP and a Bronze Trophy. 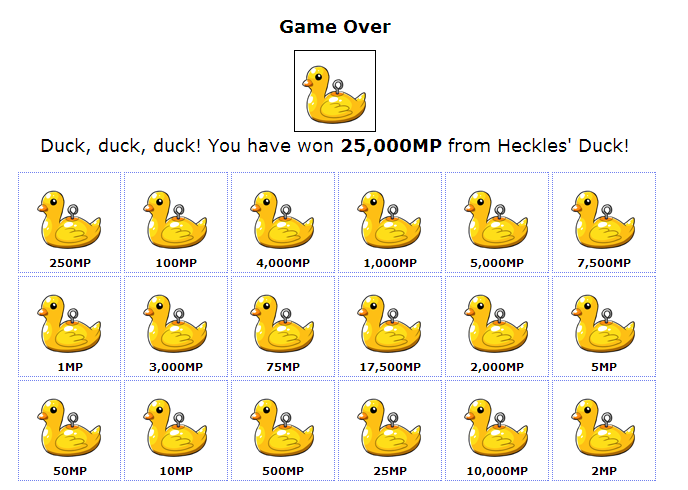 The Duck or Dive game has been added to Slater Park and the 'Free Games' countdown page. The Baby, Cupid, Earth Fairy, Injured, Mad Scientist, Pixie and Royal Renat have been updated. The Baby Snookle and the Zombie Zetlian have also been updated. The Lottery has been drawn for this week. marvistaelementry is the winner of the 68,800MP Jackpot with the winning numbers of 4, 6, 2, 12, 7 and 11! Congratulations! Last Week's Raffle has now ended. GutterxFlower is the winner of the Red DNA and 100,000MP prize with the winning raffle ticket number 1769! Congratulations! Make sure you buy your tickets for today's raffle - only 10MP per ticket! The Zola can now wear the Daylight, Ice Cream, Moonlight and Plushie Costumes. Do you have a Daylight Costume? The Knutt, Renat and Troit can now wear it! Some of the original coloured Male Shirts have been revamped. These were released years ago when the first characters were released. They not only did not fit the new character properly, there was no point having the same item added as different colours. 12 coloured shirts, polo shirts or sweaters have now changed to these new shirts. We have new and improved Icons on Profiles, Maramail and Forums. These new Enchanted Rusty Plushies have been added to the Rubbish Dump misison prize list. All of the enchanted and non-enchanted plushies have also been added to both Plushie Machines. The Forums have been updated. They have a much cleaner, more spacious design that fit with the new site layout and the character 'Experiences' feature better. We have also integrated Maratalk into the forums - making sure that this feature does not get neglected again in the future! Blogs have been moved to the bottom of the forums, giving us a lot more space for new features and improvements in the future. We also have added a new setting, allow you to hide all Signatures from the forums at any time - this should be useful for those with slower connections. These new shoes are restocking in either the male or female Shoe Shops. The July 2014 Monthly Checklist winners have been announced and the prizes have been rewarded. Congratulations to all of those who have won. Don't forget, this is a monthly permanent feature that you can enter for FREE. If you haven't already, you should start entering the August event! The Renat pet has been revamped. We hope you like the changes! A new celebrity, Amy Winehouse, has been honoured at the Lowlyhood Walk of Fame. There are 27 new 'Amy' celebrity clothes that are now avaliable for FREE at the Clothing Rack. We have renamed all existing celebrity clothing and replaced of them - that were duplicates - with 20 of these new 'Amy' clothes. Those of you who have already added the duplicate items to your Wardrobe will now be the newer Amy clothes. Two new Amy Winehouse Hair Styles have been added to the Salon. The Amy Winehouse dress up game means that there are 6 new Tattoos restocking, 2 new Female Shoes restocking and 27 new Female Celebrity clothes added to the Clothing Rack. New Amy Contact Lenses have been added to Kwazikujo's Shop, Flower Barrette to Rapunzel's Tower and Amy Bandana to Slater Stalker's Shop. The Decadal can now wear the Island, Plushie, Rainbow and Injured costumes. A new Weekly Quest Contest has just started. This week's quest game is Borak's Brew. The challenge is to complete as many of these Quests this week. The top 3 players at the end of the challenge will receive a Bug Costume, 200,000MP and a Gold Trophy, the next 6 players will receive 150,000MP and a Silver Trophy and the next 9 players will receive 100,000MP and a Bronze Trophy. The Gnome Costume has been revamped. We hope you like the changes! The Frozen Food shop in Biala Mountain has a new shopkeeper and is restocking 23 new items. The Price Changes feature in Dukka Caves has been updated. Randomly throughout the day, shop keepers of all Maradan shops will permanently increase or decrease the prices of certain items they have on sale. The feature has been integrated better with the new and improved Stock Market and also has an effect on the share prices. Galleries have been improved. The artwork, layout and descriptions have been updated and you once again edit your Gallery layout. You have have a different 'Experience' background showing for the character, BBCodes are allowed and you can change the colours of the layout. We have also added a new option to 'Centre Items'. With this option selected, the items in your Gallery will be aligned to the middle, especially noticable when you divide your items. Finally, we have brought back the Galleries list, showing you the 500 biggest galleries on Marapets, in order of Gallery Size, that actually have items in. A new Weekly Item Contest has just started. This week's item is White Chocolate Tantua, you will need to send this item to the 'Challenge' account. The challenge is to send as many of this item to 'Challenge' this week. The top 3 players at the end of the challenge will receive a Can of Lorius Wing, 200,000MP and a Gold Trophy, the next 6 players will receive 150,000MP and a Silver Trophy and the next 9 players will receive 100,000MP and a Bronze Trophy. The User Shops feature has been improved. The artwork, layout and descriptions have been updated and it is all now much more user friendly. Your Sales History will now show the images of the items you have sold and your Shop Till has the MP total inside the form ready for you to withdraw. The Edit Shop is back and better than ever! You can now to have a different 'Experience' background showing for the character in your Shop and once again customise the colour scheme of the layout. You can also now use BBCodes inside your shop's welcome greeting. The items on sale in your shop also have the same layout now as the main restock shops in Marada to make it more consistent. Your avatar, shop size and online status will also show in your shop and the pages for shops are at the top and bottom once again. Have you used the Shop Pricer Giftbox? The Auto Price function for shops is now smarter! You now have to option to change the auto price settings to 1MP cheaper or 1MP more expensive than the lowest price on the Shop Search. Finally, we have brought back and improved a very old feature. The Shops list will show you the 500 biggest shops on Marapets, in order of Shop Size, that actually have items in stock. It has also been added to the new Puchalla Village map. The Decadal can now wear the Sleepy, Pixie, Spring, Gothic, Toddler and Superhero costumes. The Giant Flowers shop has a new shopkeeper. We have also updated the layout of all shops in Marada. Items are shown in rows of 5, instead of 6 and the price and currency each item sells for is much clearer now! The security codes have been removed from the Shop Search. A new Weekly Battle Contest has just started. This week's opponent is Sprite, you will need to have a Sprite Trading Card in your Battle Deck. The challenge is to win as many battles against this opponent this week. The top 3 players at the end of the challenge will receive a Evil Tree Trading Card, 200,000MP and a Gold Trophy, the next 6 players will receive 150,000MP and a Silver Trophy and the next 9 players will receive 100,000MP and a Bronze Trophy. 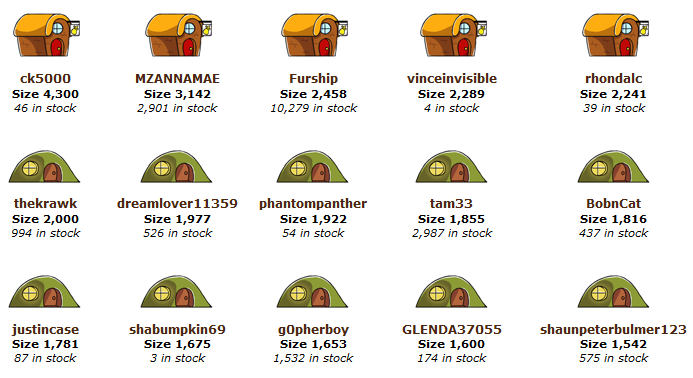 The Stock Market in Puchalla Village has been updated. The stock market allows you to invest in any of the shops in Marada. They have both been integrated better, with the share price now showing on each shop and the sales/profit trends of each shop now changing the share price more. Invest your MP in a company and if the share price goes up you will make a profit! We have also removed the auto-sell of shares after 30 days and stopped the share price from going into negative. We have updated the High Scores lists. All banned players are now automatically removed. We will do the same for Pet highscores shortly. Your Attic has also been updated. The Shop Search has also been updated to match its new home in Puchalla Village. There are also now quick links to Auction and Trade search or to create a Wanted Ad at the bottom of every Shop or Gallery search. New Account Upgrades have just been released. To celebrate the release of our new site layout, there is a double themed set of both Moonlight and Daylight pets. They both have a 1 in 3 chance of receiving an Enchanted Decadal Plushie. The Decadal is our newest pet and is restricted. As Marapets is almost a decade old, this pet will so rare that it is only released once a decade. These Account Upgrades will retire after our Birthday events and you will have to wait another 10 Years before they are released again! There will be a small number of different coloured Enchanted Decadal Plushies and Potions to be won during our Birthday events. The Decadal, Figaro, Kaala, Lorius and Kidlet are the first pets to wear the Daylight Costume. The Walee, Yuni, Decadal, Chibs and Vixen are the first pets to wear the Moonlight Costume. The Decadal is now avaliable as Minipet and Zombie. The Lottery has been drawn for this week. Shera50 is the winner of the 80,500MP Jackpot with the winning numbers of 11, 15, 19, 21, 25 and 3! Congratulations! Last Week's Raffle has now ended. ruthva is the winner of the Red DNA and 100,000MP prize with the winning raffle ticket number 4518! Congratulations! Make sure you buy your tickets for today's raffle - only 10MP per ticket! The Alien Invasion has begun! Trojan and his school friends Boogle, Oogle, Snoogle and Troogle are wreaking havoc all over Marada! Search them out and fend them off to save Marada from this menace! The Fatty, Jinx, Bush and Billy are the first minipets to wear the new Ball of Alien Yarn. The Monster Account Upgrade will be automatically retiring tomorrow, July 27th. The Operations Portal in Enpiah has been updated. Paper Hats from the Crackers you can win at the Biala Christmas Tree have been revamped and can now be added to your Wardrobe for your character to wear. The King Baspinar Paper Crown can also be added to your Wardrobe.